When your braces finally come off, you’ll hopefully be astounded by what you see –once-crooked teeth replaced by a more attractive smile. But you might also see something you didn’t expect: noticeable white spots on some of your teeth. These spots called white spot lesions (WSLs) appear lighter than the surrounding tooth enamel due to mineral loss just beneath the surface. 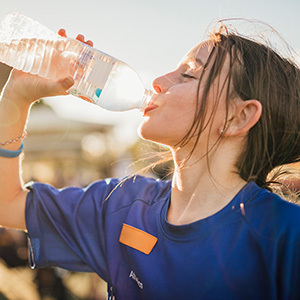 This happens because bacterial or food acids have contacted the enamel surface for too long and dissolved the underlying calcium and other minerals. This results in a small discolored and chalky-like area in the enamel. WSLs are common during orthodontics because wires and brackets create hard to reach places for brushing and flossing, which can accumulate bacterial plaque. The bacteria produce acid, which weakens the enamel at these places. The tiny white spots that result are more than just unattractive—they can become entry points into the tooth for decay. That’s why they should be dealt with as soon as possible—and preferably before they’re created. To that end, you’ll need to do as thorough a job as possible brushing and flossing while undergoing orthodontic treatment. To improve your thoroughness try using an interproximal toothbrush that can maneuver more closely around braces hardware than a regular brush. You can also improve your flossing with a floss threader or a water flosser, a device that sprays pressurized water to loosen and flush away plaque. If you do develop WSLs, there are some things we can do to treat them. We can attempt to re-mineralize the affected enamel with the help of topical fluoride (either pastes or gels for home use or with an office application) or a re-mineralizing agent. We can also use techniques like microabrasion, which restores damaged areas beneath the surface, or inject a liquid, tooth-colored resin beneath the WSL’s surface to improve appearance and protect against decay. 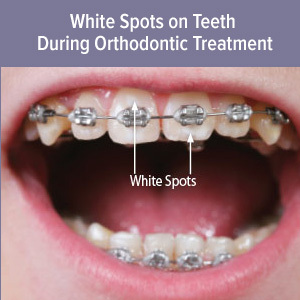 If while wearing braces you do notice any white spots or other tooth discoloration let your dentist or orthodontist know right away. The sooner your dental providers can begin dealing with potential WSLs the better your chances for a healthy and beautiful outcome after braces.